First reported by the XDA Portal team, developer acervensky has created a Magisk module specifically for the OnePlus 6. It routes the audio from any app through both the regular bottom-firing speaker and your earpiece speaker, and it separates the left and right channels to make true stereo sound. The earpiece speaker is normally intended for phone call audio, but acervensky has raised its max volume to a safe, but audible level. You'll need Magisk and you'll have to be running the stock ROM on your OnePlus 6, but beyond that, it's a simple procedure. This stereo sound mod is a Magisk module, which means you'll need to be rooted with Magisk installed. On the bright side, the OnePlus 6 is one of the easiest phones to root, and you can even root by simply installing Magisk. I've outlined this process in detail with separate guides. First, unlock your bootloader by enabling a setting and sending a single fastboot command. Then, install TWRP recovery, which only takes a few minutes. From there, just flash the Magisk ZIP to root your phone and you'll be ready to go! The module that gives you stereo sound isn't hosted on the official Magisk repo, so you'll have to download it. To do that, just tap the link below from your OnePlus 6 and the file should download automatically. Next, open your Magisk Manager app, then swipe in from the left edge of your screen to open the side navigation menu. From there, select "Modules," then hit the yellow + button at the bottom of the screen. Your phone's internal file browser will open. 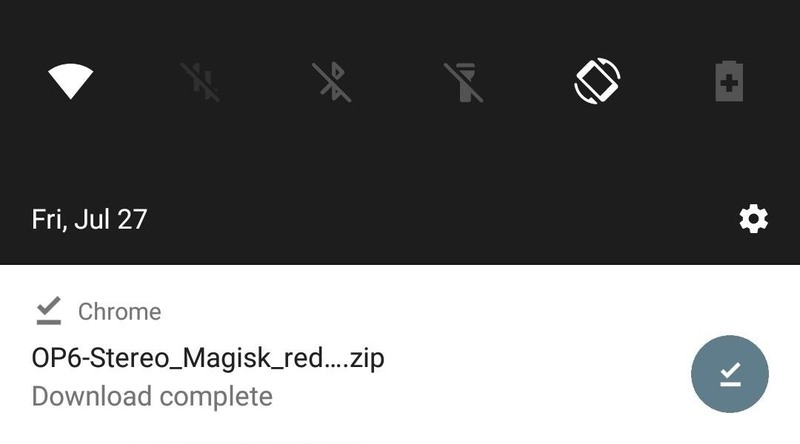 Head to the side navigation menu again and select "Downloads," then choose the OP6-Stereo_Magisk.zip file. Magisk will now install the module. After a few seconds, hit "Reboot" when prompted. When you get back up, your phone will now have stereo sound. The mod is applied system-wide, meaning it works in every app on your phone. You'll still be able to control volume using the same buttons and on-screen interface, so the only thing that's changed is the stereo output. The speakers aren't perfectly balanced — in fact, the earpiece speaker will be noticeably quieter than the main bottom-firing speaker. The module's developer has made the earpiece speaker as loud as it can safely go, but it does push out some decent sound and the stereo effect is definitely noticeable. How's this sound mod working on your OnePlus 6? Let us know in the comments below.